You are here: Home » Time For The After Party! 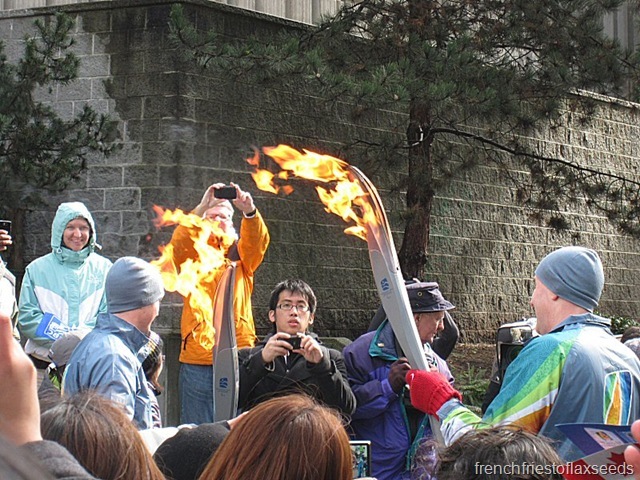 I know I said the Olympic recaps were over, and technically, they are. 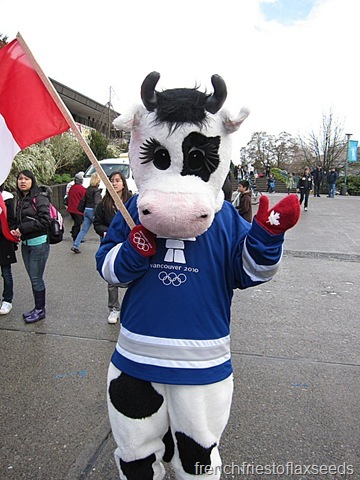 But let’s be honest – the Olympics are still a big topic around here in Vancouver. 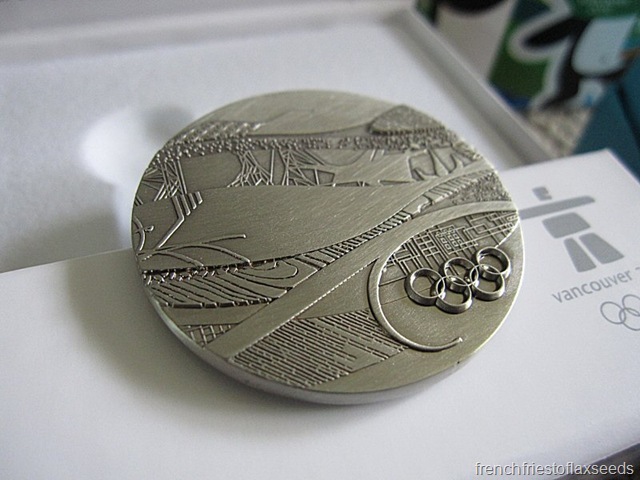 It was weird to wake up the morning after the Closing Ceremonies, and not check the news to see what events were on, what medals we have a chance at winning, and not heading downtown. 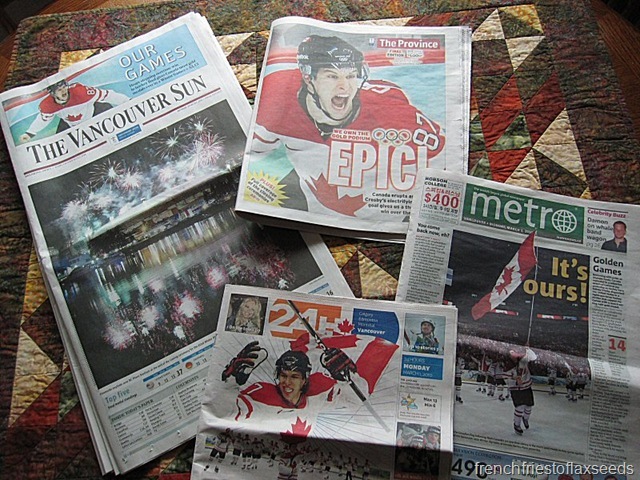 At least the newspapers kept that feeling going a little longer with their golden hockey recaps. 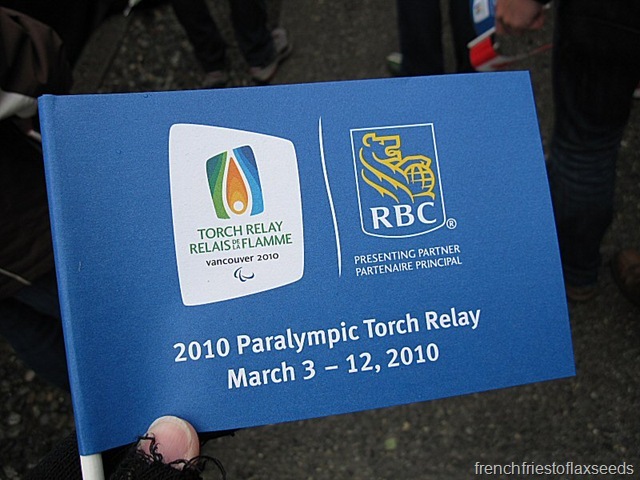 Fortunately, I had many Olympic related activities to keep me going through the Paralympics Games. Like surveying all the Olympic loot I had amassed as a volunteer. Sure, we had all the clothes, but we also received a variety of “shift gifts” as the Games went on. On Day 3, we received an exclusive volunteer pin. Day 6 was a plush toy mascot. We had a choice of either Miga or Quatchi. 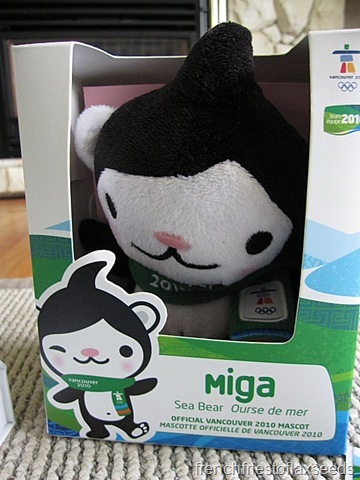 Since I already had a Quatchi, I went with Miga. 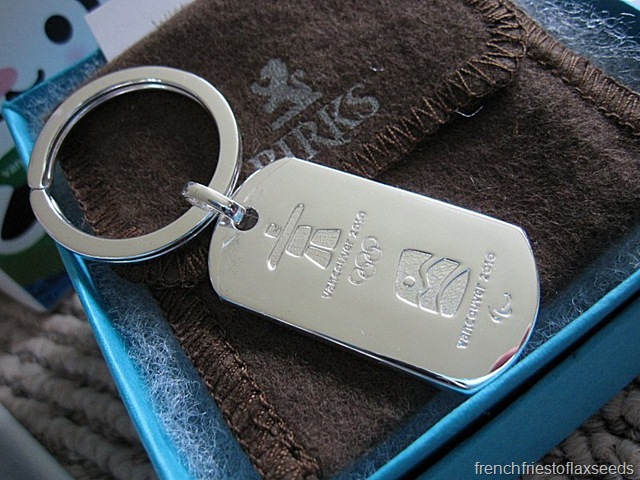 Day 9 was really nice – a silver plated exclusive key chain from Birks. It’s too nice to use! Day 12 was…odd. 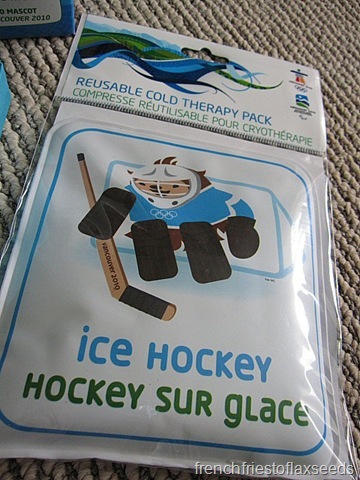 We received a cold pack with one of the mascots on it. I guess they figured by then, we’d be tired and sore from all those shifts and needed it! But that’s not all! All volunteers received a Swatch watch on their last shift. 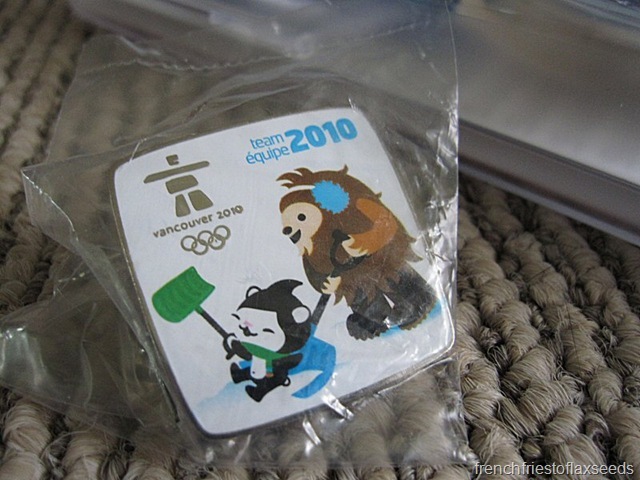 As well, we received participation medals as part of Team 2010. 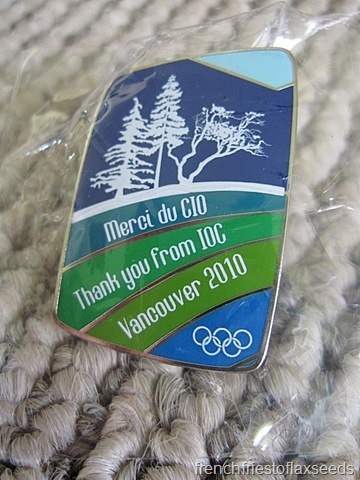 And the International Olympic Committee also presented us with thank you pins. 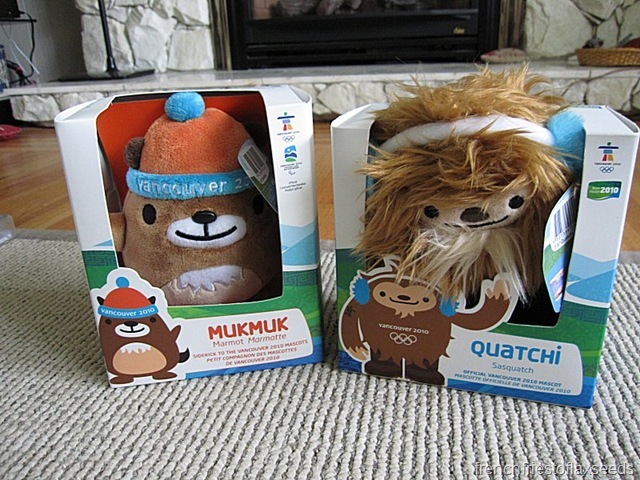 I may have obtained some more plush mascots – mom gave me her Quatchi gift, and I scored a Mukmuk on sale 😉 Sadly, I’m still missing Sumi, the Paralympic mascot. 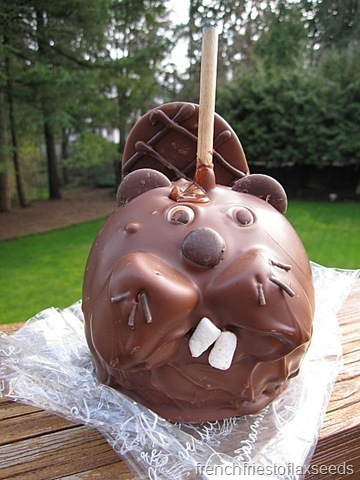 Speaking of purchasing things – this cute little chocolate critter found its way home with me. 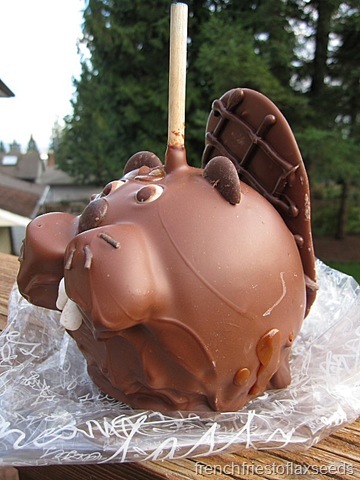 A chocolate caramel apple beaver. How could I not bring this beauty home? 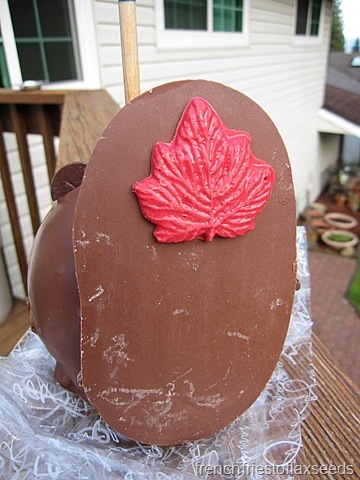 Especially with the little red maple leaf on the tail! 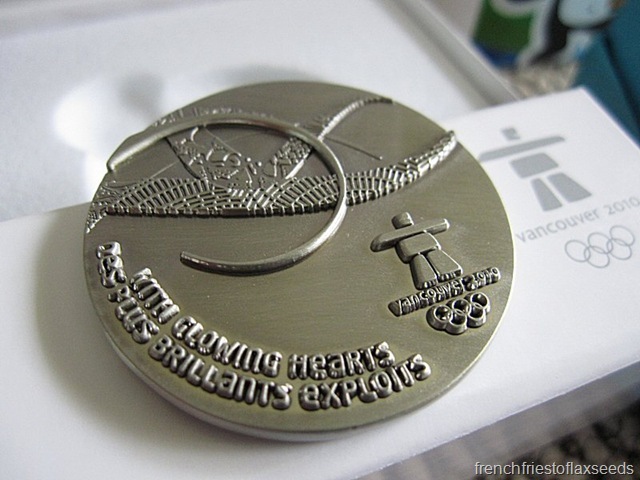 All of my visits to the various pavilions around town left me with quite the collection of Olympic pins. 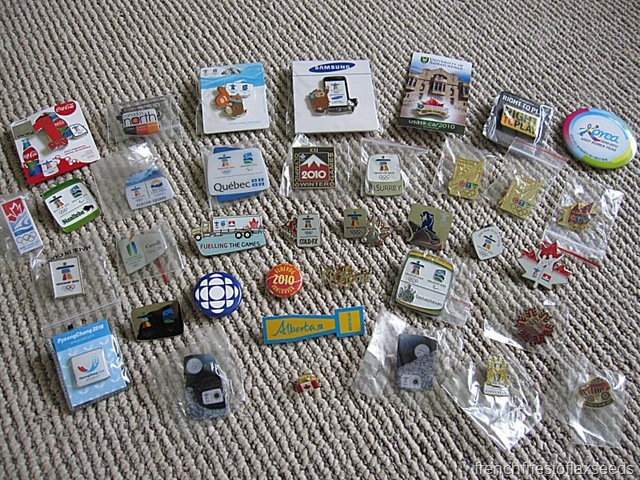 Did I mention I used to collect pins as a kid? That and postcards. There were plenty of contests going on at all the pavilions as well. And yours truly even managed to win one! 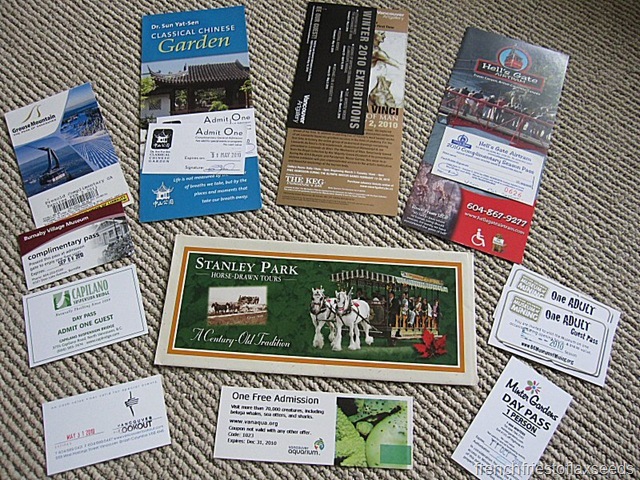 It was a prize pack from the Vancouver Coast & Mountains Region, with passes to 11 different attractions around Vancouver. I’d imagine that it’s worth over $150 in admission prices. 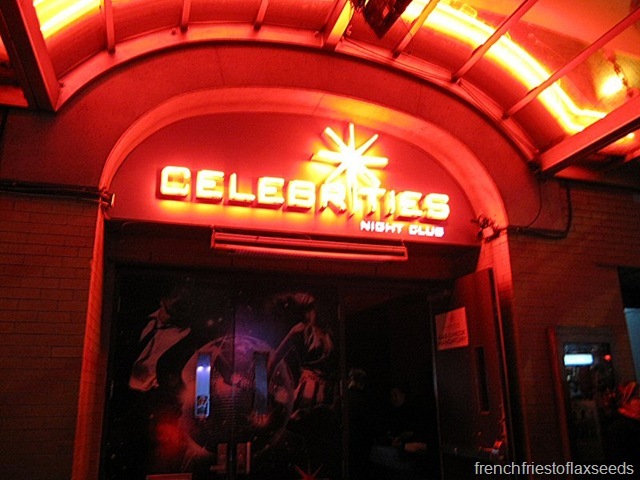 Pretty cool – alot of these places I haven’t been to since I was a kid! The day after the Games, I had one last event to look forward to – our Canada Hockey Place volunteer wind up party! 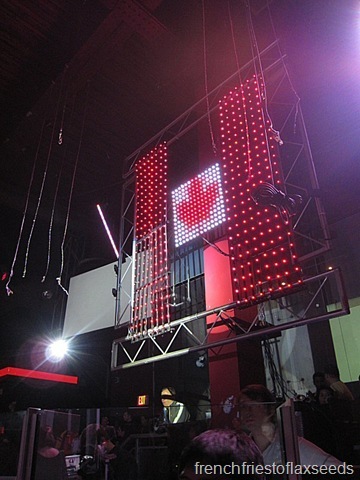 It was held at Celebrities Nightclub in downtown Vancouver. 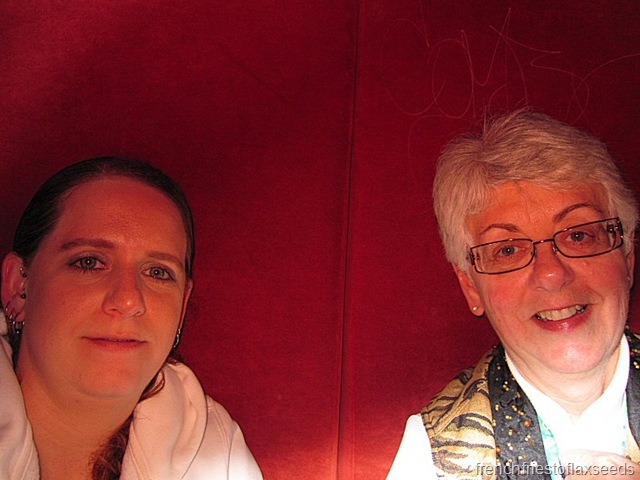 Nothing like partyin’ it up at with your fellow volunteers at a gay nightclub! Especially when one of them is your mom. Uh…excuse the quadruple chin. Self photos are never a good idea. 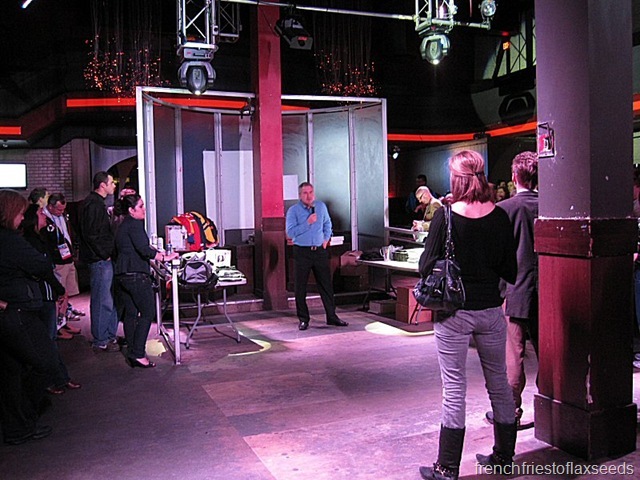 There was food, drinks, speeches, and prizes. My two glasses of merlot may have been my dinner. Shhhh. 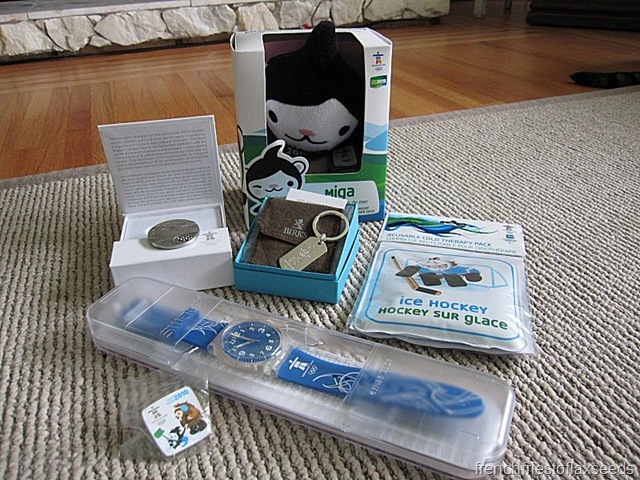 We did manage to bring home some door prizes from the party. 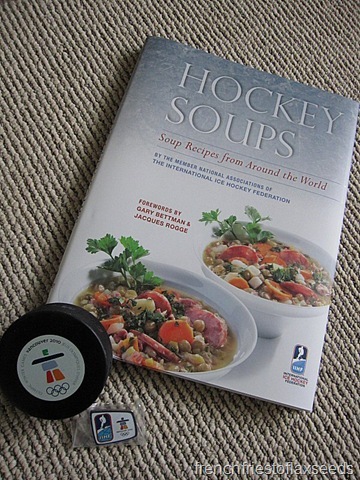 I traded the gas gift card I won to my mom for this freakin’ awesome cookbook – Hockey Soups: Soup Recipes from Around the World. Two of my favourite things all in one! Each country featured in the book has a recipe, as well as information on the hockey programs in those countries. It’s a really interesting collection. 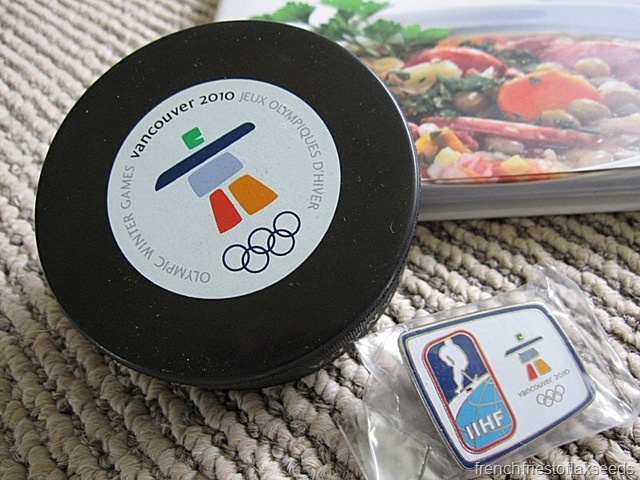 Everyone also received an Olympic hockey puck and IIHF Olympic pin. I definitely need to get on making some of those soups! 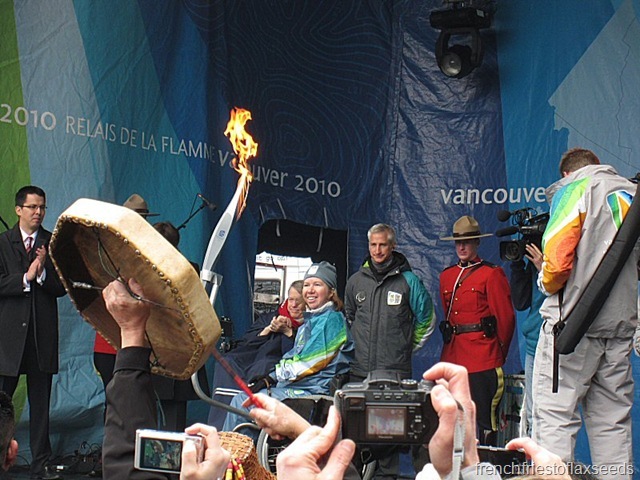 Fortunately, we also had the Paralympic Games to bring back some of that excitement to the city. I wished I could have gotten some tickets to events, but alas, with school and work, it just wasn’t in the cards. 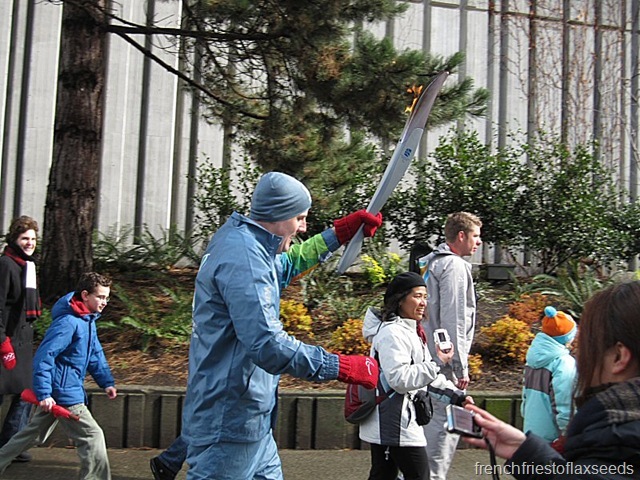 I did luck out and see the Paralympic Torch Relay while it was on UBC Campus though. It was great to see so much coverage of the Paralympics, and to see the city embrace the athletes just as much as the Olympic athletes. It opened my eyes to the way their sports are played – like with wheelchair curling, where they only shoot rocks, but don’t sweep. When you think about it, it makes sense – how would you sweep while rolling your wheelchair sideways down the ice – but until you actually see it, you don’t think about it. You really do have some wonderful stories that can be told over and over. Such a great opportunity! 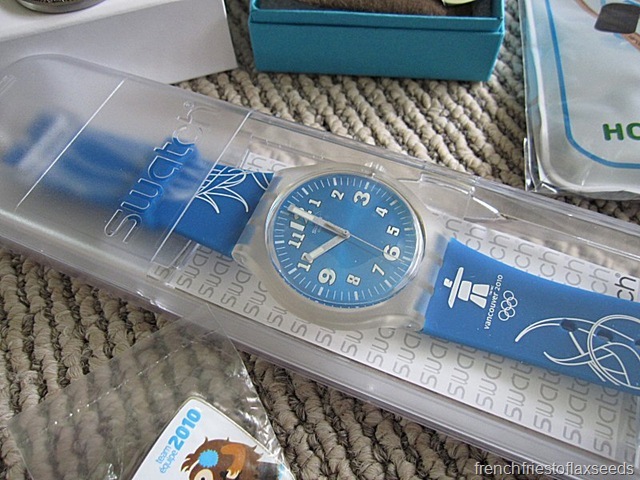 Wow that is some great swag from the Olympics! Gotta love the swag!!! I still think you lived an amazing experience!!! Is London next?